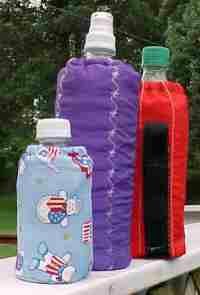 Bring your insulated beverage to parades and community events and keep them cold. Just imagine how much you can save by not having to buy from street vendors. Batting Cut 1 - 11 X 15 1/2" piece of batting and one 5" circle of batting. 12" of 1" wide webbing - Carefully use a lighter or candle to gently melt and fuse the raw edges of nylon webbing to prevent it from unraveling. If you are using cotton webbing, zigzag or turn under the edges of the webbing. Sew "hook" section of the tape, 1" from one end of the webbing, stitching around all edges of the tape. Sew the "loop" section of the tape even with the opposite end of the webbing, stitching around the tape. Lay webbing on the middle of the fabric rectangle, aligning the end to the edge. Sew a 6" rectangle starting at the bottom edge. Place the batting on the wrong side of the fabric, matching the edges and covering half of the fabric. Fold with right sides together and align the long edges. Sew a 1/4" seam. Place the elastic around the tube, matching the ends of the elastic to the top of the batting and seam allowance edges. Sew the elastic at the seam line, back-stitching to reinforce the stitching. Fold the wrong sides together, enclosing the batting — Zigzag the raw edge. Pin the elastic to the fold and top stitch 1" from the folded edge. Layer the two circle pieces with a piece of batting. Zigzag the edges together. Match the circle to the zigzagged edge of the tube. Turn inside out, so the seam allowance is inside.